Anyway -- the colors make me happy. 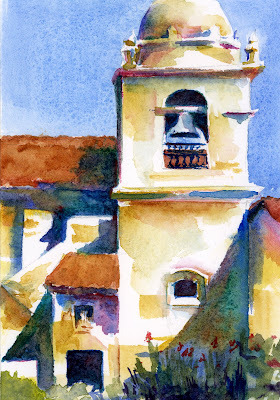 Above: 4 1/2" x 6 1/2" Arches 300# HP WC paper -- "San Somewhere -- Western U.S., The Postcard Series, #3 (Mission Bell)"
So, look, Teri! A cactus for Cactus Monday! But on Tuesday. And for you music lovers -- I'm listening to Coldplay's BRAND NEW album - Viva la Vida, which just came out today. Great so far! He was the best cat in the whole world. At least, the best cat that I've ever known. This picture was taken a few weeks ago after he'd lost a good bit of weight. For some reason, right now, I can't find any really good pics of him -- they're on the hard drive somewhere. This weekend he really went downhill, and I had to take him into the vet this morning. Turned out to be his final trip. And that's okay -- it really really is. He came to us as a stray when he was still young -- maybe a year old. He had a terribly crooked tail, and I had just taken a long series of tissue mobilization courses -- of course I had to practice on him. I would mobilize his tail until all of his vertebrae went pop-pop-pop and everything straightened out. After a few treatments he decided he would keep me. Over the past 16 years or so he gave me the chance to practice first aid and wound care many many times. He was a good sized tom -- healthy and slim with a large frame, and for years he reigned as King of the Cats in our neighborhood. He was always a good patient, and would sit very calmly while I worked on his frequent wounds. No matter what was going on, even after he got sick, he was the terror of the Cardinal crowd, and baby bunnies were told nighttime horror stories about him, I'm sure. He had the most wonderful soft side, though. Kids could play with him without a worry, even though he was fully clawed. He never scratched or bit, and would wait until the second or third time that someone picked him up by the tail before he would finally just walk away. He was always by my side when I worked in the yard (I hate to think of the times that I called it "being underfoot"...). He would come running when we raked leaves, because he loved to get in the pile until he was covered, and then he would EXPLODE out and attack the rake. Funny cat. ...and RuPaw would go back to get her. He would walk just at her shoulder with her chin hovering over his head. They would walk together out into the back yard until there was a good place for them both to sit down together. Once she was settled, he would then go on his way. Now really. He was the best cat ever. Sometimes I just get bored and need to do a quick doodle ... wishful thinking in motion, I guess. I'm the really skinny chick in the expensive bathing suit. Yep. 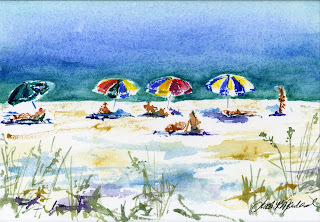 Above: 4 1/2" x 6 1/2" Arches 300# WC paper -- "Seaside, Florida -- Spring Break, The Postcard Series, #2 (Beach Umbrellas)"
Whew. I never thought we'd get through that Everyday in May theme, did you? You can't imagine how difficult if was for me to go for an entire month without drawing. What ... you mean I got it backwards? We were supposed TO DRAW every day in May? Oh dear. Okay, so I did say to some of you at the end of April that I was looking forward to the Everyday in May challenge. And I really was! But you know how it goes -- the minute you say something like that, THAT is when Murphy walks through the door. RuPaw the cat is still around, but has more bad days than good days. We are giving him subcutaneous fluids, which makes our house look at bit like a kitty hospital. Some days he will eat regular cat food, other days we have to resort to baby food (turkey is his favorite); tonight he nearly fell over with excitement about a few bits of leftover orange roughy grilled with teriyaki sauce, which made Doug and I feel a bit guilty about not leaving him more leftovers! At his lowest point he wasn't eating anything and I accidentally discovered a mixture that perked him up considerably -- Karo syrup mixed with a big spoonful of mayonnaise and evaporated milk. Yep. Nasty sounding, isn't it! But he lapped it right up. Every now and then I will still give him a spoonful of mayo, just because he likes it so. Still, I don't think we have too much longer with our buddy, and I don't think I'm going to put him through any more doctors. Sadly, my sister lost her most excellent of cats last weekend after a long bout with kidney disease, too. Mackenzie had been Kathy's cat since she was a kitten and from the time Kathy was in her first apartment in a city all by herself. She was a great cat. Around the house we've really been working on the yard this year. The landscaping is showing the effects of the drought we've had here the past few years. I lost at least one huge rhododendron, and probably will lose a second. Several small flowering bushes and trees didn't make it through the winter, and even the day lilies look worse for the wear so far this year. We cleared out several very big shrubs and small trees, and pruned the rest down more than we normally do to give things a fighting chance to recover. I also started a bit of a vegetable garden along the back of the house between the stumps of glory holly. If it goes well, we'll dig the stumps out. If it doesn't, we'll let the shrubs come back! Ahhh... but the hardest part of the summer yard work is DONE, and we can just enjoy it now. 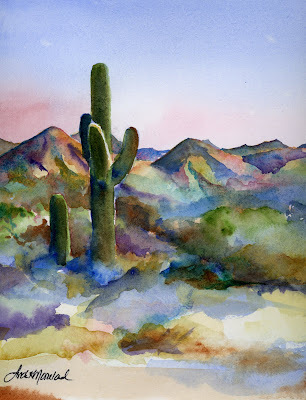 Art-wise, I submitted a couple of pieces to a juried show, and both were accepted. Miss Vanilla Cupcake went in (finally finished, matted, and framed!) along with an acrylic painting of a cloud on the beach in Destin. Diahn submitted three pieces and all three of hers were accepted, also. We had a big laugh about how calm we were this year compared to last year, when it was our very first juried show! My art class also did a collaborative project, making a shoe shaped book, with everyone submitting an original watercolor page. One of the guys in class teaches bookbinding, so he put the whole thing together just beautifully. We were featured in the local newspaper, and the book was auctioned off this weekend with the proceeds going to benefit the art center. I just heard this afternoon that the book went for $400 -- a nice donation to the center! Painting at top -- 4 1/2" x 6 1/2" watercolor on 300# HP paper -- "Seaside, Florida -- Spring Break, The Postcard Series, #1 (Beach Houses)"